Birds, rabbits and dogs together sounds like quite the menagerie! Noah's Ark jokes aside, it's possible to make life work with so many species in one space. If you take your time with introductions and provide for each animal's needs, you can pull off this furry, feathery balancing act. 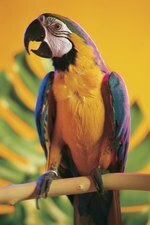 Your birds need attention as well as protection from too much commotion. Set up the birdcage in a room you frequent but isn't where you let the dogs be rowdy. Your birds need a secure cage -- one they can't escape and one the dogs can't get into. Make sure there's no way your dogs can knock over the cage. If possible, keep dogs out of the room where your birds are housed unless they're supervised. Your birds may or may not find the rabbits threatening when they're all out of their cages. Whether they will get along depends on the individual animals. An outspoken, territorial bird might "dive bomb" your rabbits. A docile bird may just go about her business, not noticing Fluffy on the floor. Your rabbits need to learn that the dogs won't eat them (and for that statement to be true). The most pleasant way for a rabbit to meet a dog is for the rabbit to be in her cage (safe place) with the dog on leash. They'll need to be introduced to each other several times before they can adjust to one another. Even after they become comfortable with each other, it's safest not to leave them alone together, especially when the rabbit is free. Your rabbits also need a quiet place to live. A screechy bird might pose a problem for a peace-loving bunny. Start out with birds and rabbits in separate rooms. After they've met several times, decide whether they'll be OK housed in the same room. Your dogs need room to "be dogs" without getting scolded for scaring the bunnies and birdies. Their rambunctious play style isn't wrong, it's just not well-suited around other, more fragile creatures. They also need to understand that the other animals are family members, not toys or prey. This could be a long, patience-testing learning process, but it's essential to ensure the safety of all your animals. The House Rabbit Society recommends praising your dog whenever he has a positive, gentle interaction with the other animals. They suggest using the word "gentle" in this positive setting, so when it comes time to remind the dog to be gentle later, he will understand the word and know what to do. The House Rabbit Society also stresses that "back yard dogs" and hutch rabbits should never live together because their natural instincts are too strong to overcome. Even the most experienced multi-species pet owners don't let their animals alone together loose and unsupervised. Many don't even allow Rover to waltz into the room where Tweety's and Bugs' cages are kept. Even if your animals are adjusted to one another, the unexpected happens. Take time to train each animal the proper way to behave around the others, and err on the side of safety. It can take months for your pets to become totally comfortable with one other. The animals should set the pace when increasing their interactions so they can stay within their comfort zones. This can make acclimation a very slow process, but it's important to your pets' happiness. As long as you provide for all your animals equally and respect their needs, you'll find a way to have one big, furry, feathery family all under one roof. House Rabbit Network: Can Dogs & Rabbits Live Together Happily Ever After? Birds N Ways: Can Dogs and Birds Get Along? Wisconsin House Rabbit Society: Bunnies and Dogs - Together?